Vanessa Marlin, a 2008 Mills alum, bought a flower shop and her flower arrangements have helped reconnect family and bring simple delights into people’s lives. Nationally acclaimed haunted house enterprise, Fear Overload Scream Park in San Leandro, hopes to scare its customers away this year by making their Halloween attraction so unpleasantly scary that visitors are sure to be screaming — for more. 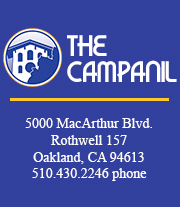 Madeline Adamo is a contributing writer for The Campanil.